One of Chinas Ten Famous Tea. Bi Luo Chun green tea is from Dong Ting lake region and it is the second prized green tea. The technique for collecting Bi Luo Chun tea leaves are very complex with only the tender tips of the leaves used in the tea making process. The Bi Luo Chun tea involves a particularly labor intensive process but the end result are tender and wonderfully fresh and aromatic green tea. It is soft and smooth in the mouth. The flavor is rich and full-bodied and the sweet nutty flavor of the leaves should be appreciated before, during, and after infusion to enhance the tasting experience. Take care not to overbrew this tea as it is very sensitive to brewing parameters. 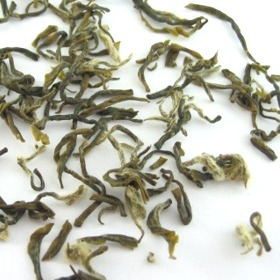 The tea leaves are partly covered with white down and rolled in spiral shape. The liquor is light yellow in color. When the tea leaves unfurl during brewing you can see that each tea leave contain 1 buds and 2 leaves. We recommend using glass-based or porcelain tea ware. Rinse tea cup and teapot with hot water. Use about 2.5 - 3 grams of tea leaves (1-2.5 teaspoons) for every 225 ml of water. Steep tea leaves in hot water at 70°c (158°F) to 80°c (176°F) for 1 minute for the first and second brewing. Gradually increase steeping time and temperature for subsequent brewing.